There’s something oddly satisfying about peeking into someone’s fridge. I realize this sounds a bit creepy, lol. I think this satisfaction comes from seeing how other people store food, what they love to buy and eat, and their favorite food containers. Having a plan for how to use food (a meal plan) along with organized food spaces, sets me up for weekly real food success. Doing these things does require forming the weekly habit of planning and organizing. As Rory Vaden says in his book Take the Stairs, “Winning is a habit.” If we want to “win” at a real food lifestyle, we have to create habits that will help us do so. I would argue that these habits also simplify life in the long-term. When your fridge is organized, you can clearly see what’s inside which means you’re more likely to actually use the food in your fridge. 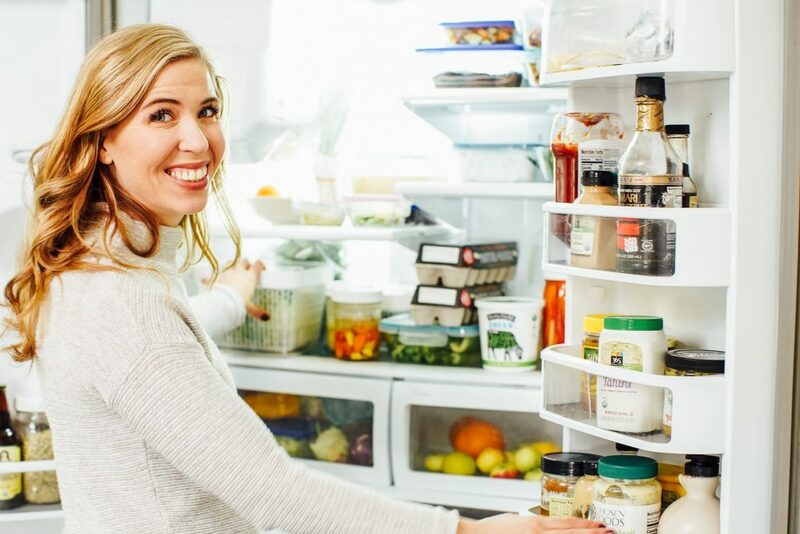 When you’ve taken the time to organize your fridge and store your food properly, you’re less likely to end up throwing away half your veggies at the end of the week. How you organize your fridge may look different than how I organize my fridge. Find a “system” that works for you. Try a few different systems if you want to. For me, grouping like things as much as possible is helpful. I talk about this concept in the video. Is this system always perfect? Is my fridge always perfectly grouped and organized? No and no. 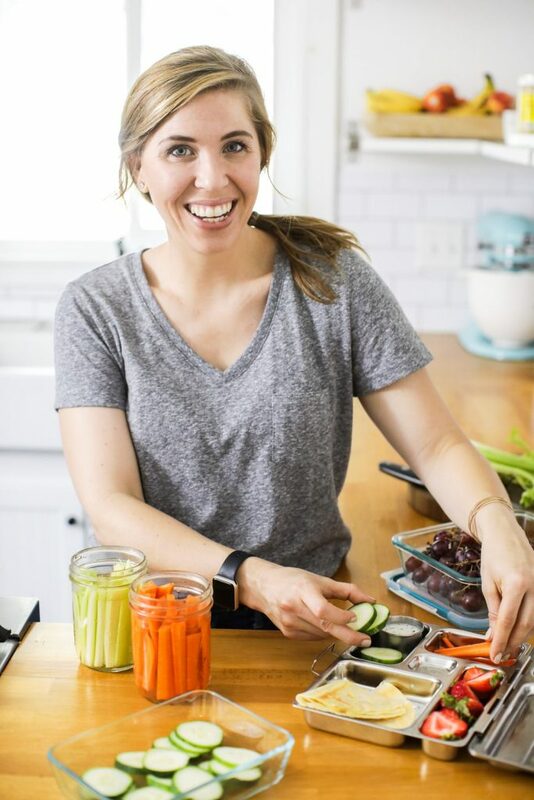 The goal isn’t perfection, and I certainly don’t feel bad when things get messy or put back in places they “shouldn’t be.” The goal is to simply create a space where we can easily find ingredients and food. Because when food is visible and appealing (not rotting), we’re more likely to use our ingredients and enjoy a real food lifestyle. I wrote a post about how I clean and organize my fridge. You can read it here. 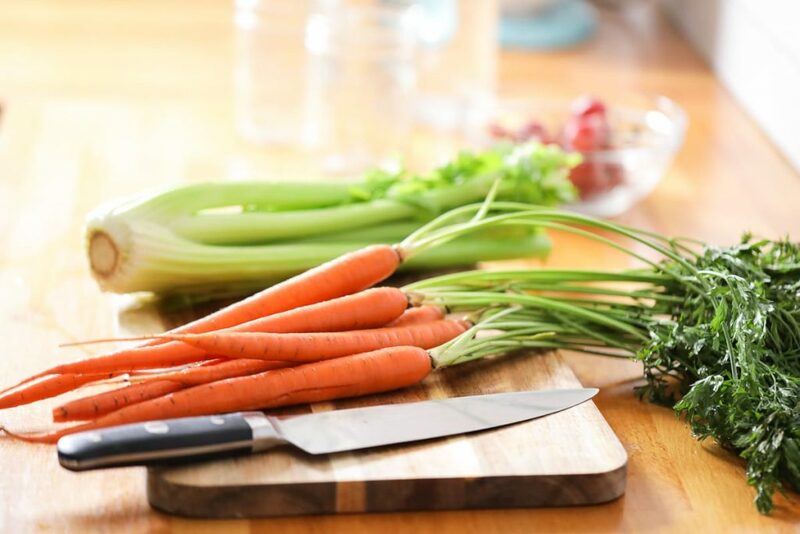 In the video, I talk about storing carrots and celery, radishes, strawberries, greens, green onions, turmeric and ginger, and herbs. Over the years, I’ve found storage techniques that work well, meaning my produce keeps for an entire week, if not longer. You can read more about how I store herbs (and green onions) in this post. And how I store berries in this post. This post will walk you though my favorite way to store carrots and celery. There are some fruits and veggies not pictured in the video because they are stored on my counter. This includes: avocados (once ripe, they go in the fridge produce drawer), bananas, tomatoes, onions, potatoes, garlic, fresh basil, and any hard squash (i.e. butternut squash, acorn squash, etc.). Ball Mason Jars (with plastic white lids): I purchase my jars at Target. I find the wide-mouth jars work best for food storage. The metal lids are awful for storage. Trust me, buy the plastic lids! You can find the plastic lids on Amazon or at Target. 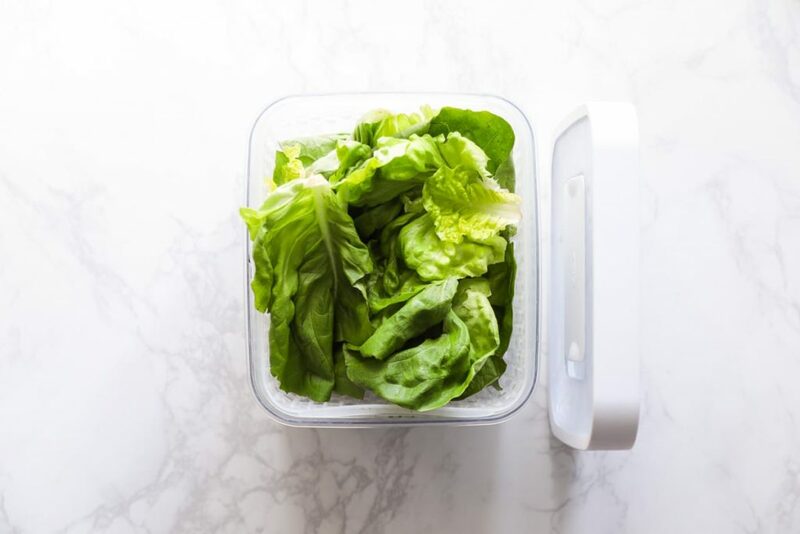 OXO Produce Keepers: I use the boxes for storing greens. I prefer the medium-size box. You can also find these at Target. Snap Ware or OXO (Snap Ware-Like) Containers: You can also find these containers at Target, sold individually. These come in small and large. Pyrex: I have the 3-cup size and a 6-cup container (perfect for large berries or soup). You can find these on Amazon in a set or individually from Target (3 cup size and 6 cup size). I have 6 3-cup containers and 1 6-cup container. I love these containers because you can see through the containers, which means food is visible. Everything mentioned is glass, except the OXO containers. You can read more about how I use these containers in this post. 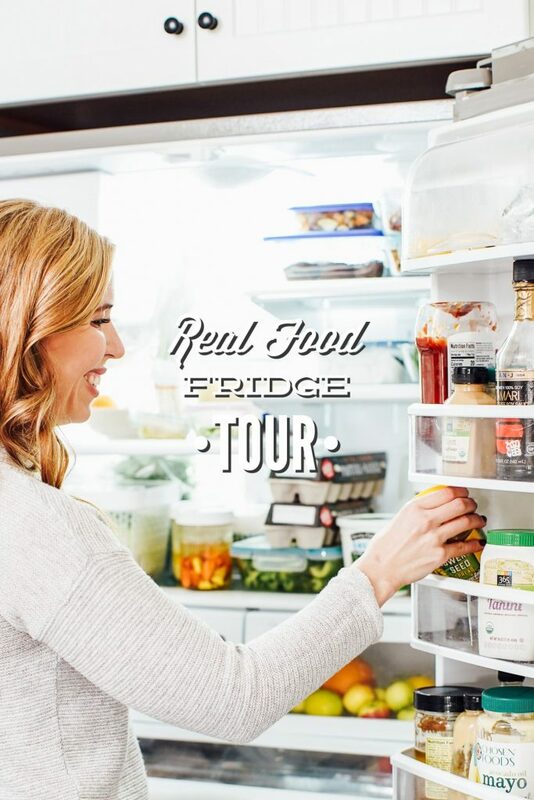 I’m thinking about sharing a pantry and freezer tour in the future. Would that be helpful? Also, if you have any questions about specific food storage, not highlighted in the video, comment below and I’m happy to share my tips. I love your blog. The quality of your pictures is amazing. And you look beautiful kristin. I loved the storage tips you shared in this post. Thank you, Dimple. I’m so glad you’re finding the blog the helpful.